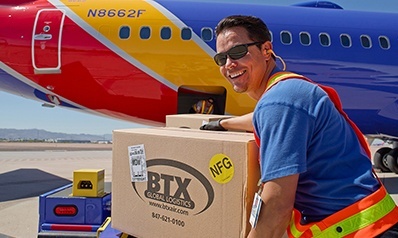 BTX Global Logistics provides ground services to our customers using a broad portfolio of service options. Whether you’re shipping a pallet or booking a truck, we deliver integrated solutions for your supply chain through LTL, FTL, Expedited, Residential Delivery and Specialized services from coast to coast. Less than Truckload service to virtually any address in North America. A full range of service options are available to meet your individual needs, including liftgate, exhibit and specialized services. Full truckload service via BTX’s network of certified providers. Truckload services are available via rail or over the road. Expedited services throughout the U.S. Vehicle types range from vans to trailers. Shipments picked up and delivered on “exclusive use” equipment. Team service available to meet customer deadlines. BTX Home / Residential Delivery connects you to every residential address in the United States. Standard services include two-man, lift gate and threshold delivery. Assembly and specialized services also available. BTX Commercial Delivery offers your customers the service and set up assistance they require. Standard services include two-man, lift gate and threshold delivery. Assembly and specialized services also available. Specialized services are available for oversized or out of gauge shipping. Permits and vehicle escorts provided by BTX. Our logistics experts can service your trans-border needs crossing between Canada, the U.S. and Mexico. We take care of everything so you don’t have to worry about a thing. With the driver shortage, increased fuel prices and truck capacity challenges, intermodal transportation can be a cost-effective solution for the transportation of your freight. Trucking services to and from seaport, border point, inland port. BTX can combine drayage with any of our ocean service lines or as a standalone service.